Welcome Home Series<sup></sup> handlesets are the perfect addition to your front door to create a unique and fashionable entryway to your home. Each is stylishly designed to provide maximum-security protection. There are many styles, finishes and configurations from which to choose. Square Pocket Door Lock The crisp, clean appearance of the Satin Nickel finish adds to the overall look of the product and brings a modern feel. The Bright Brass Pocket Door Edge Pull allows for quick closing of a pocket door that is hidden within the wall. With a push of the top, the bottom reveals a little handle to manipulate the door with. Handle fits a 1-1/8 to 1-3/4 in. thick door. This pull handle comes complete with screws and hole template for a quick and easy installation. A 1/2" drill bit and chisel are required for cutout. 1031 Satin Nickel Square Privacy Pocket Door Lock Welcome Home Series<sup></sup> handlesets are the perfect addition to your front door to create a unique and fashionable entryway to your home. Each is stylishly designed to provide maximum-security protection. There are many styles, finishes and configurations from which to choose. 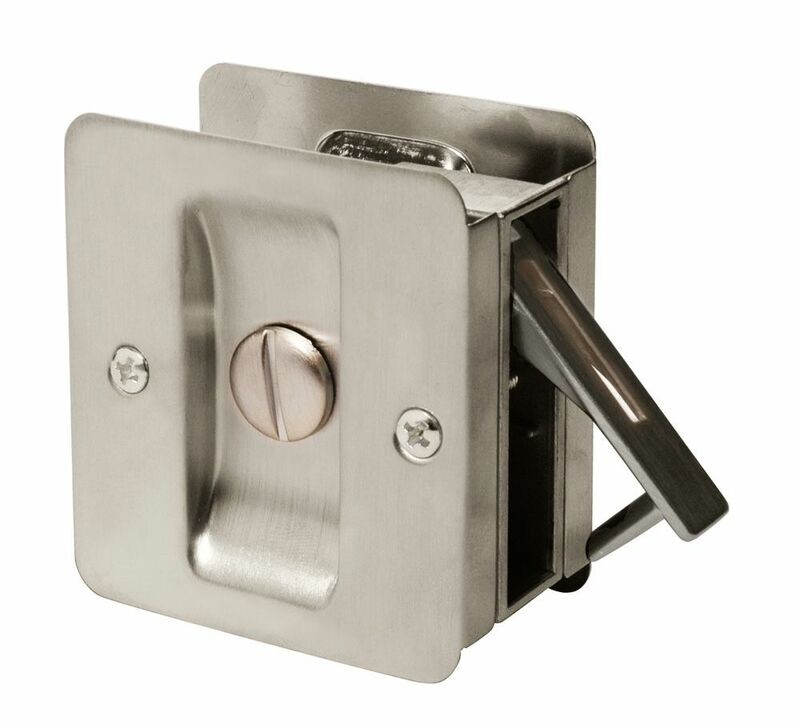 Square Pocket Door Lock The crisp, clean appearance of the Satin Nickel finish adds to the overall look of the product and brings a modern feel.